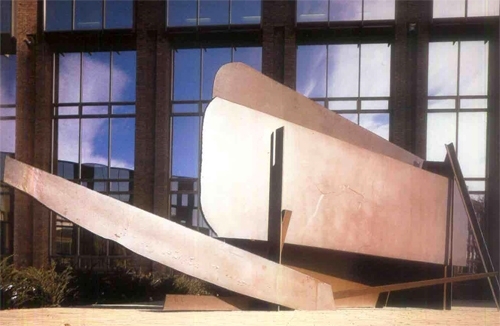 Anthony Caro (Sir Anthony Caro OM, CBE) is internationally recognised as a major figure in contemporary sculpture. He is best known for his large, often brightly coloured abstract sculptures standing directly on the ground. By dispensing with the plinth, he invites viewers to engage with his works on a one-to-one basis. He has also made a number of works using rusting steel that changes over time as the weather affects the sculpture's surface. This work, is made from oiled mild steel and standing just over two metres high was originally situated at Stuart House in the City Centre. Until recently Lagoon was situated in Thorpe Meadows.